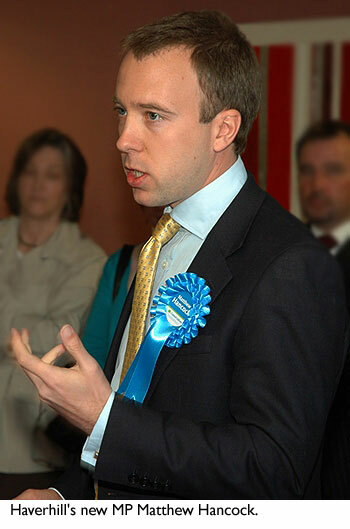 Haverhill's new MP Matthew Hancock was paying his first constituency visit to the town this morning since being elected last week. He was due to spend the morning visiting the town's two upper schools. Mr Hancock visited Howard Lay, the headteacher of Samuel Ward Arts and Technology College for a brief tour and to hear about matters affecting the school. Then he went on to Castle Manor Business and Enterprise College at the invitation of Madeleine Vigar, the headteacher for a general update on progress there. Castle Manor recently gained approval from the last Government to become an academy, but how the usual new premises which accompany such a move were to be funded was less clear, and will now be down to the new Department of Education, headed by the new education secretary Michael Gove.